Kampala, Uganda, Jun 8, 2018 / 03:01 am (CNA/EWTN News).- They came by plane, by bus, and even on foot: pilgrims traveled thousands of miles to Uganda’s Catholic shrine for the feast of the Uganda Martyrs, celebrated each year June 3. 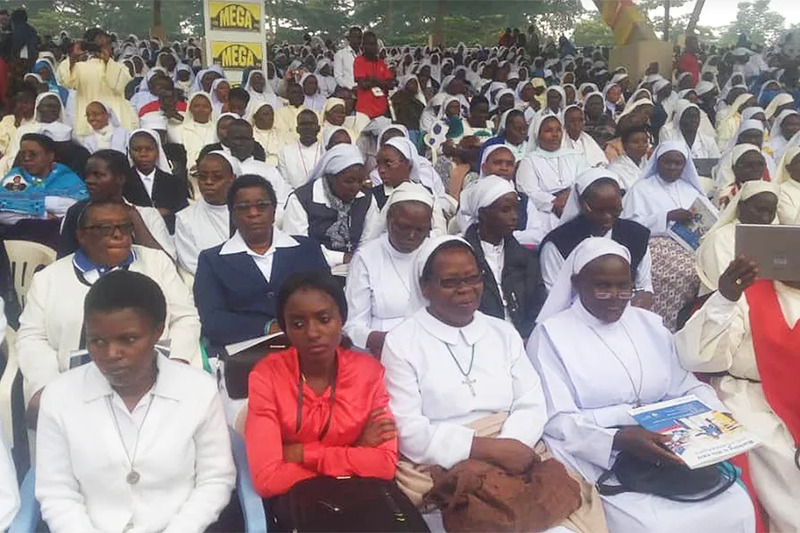 “The devotion is strong because many people have had their prayers answered through the intercession of the Uganda Martyrs,” Francis, a representative of the shrine, told CNA. Every year, thousands of pilgrims make the trek to the shrine on foot, including 90 year-old Mzee Bernado Tibyangye, who walked for two weeks to attend the celebration this year. “When I was young I used to pray through St. Andrew Kaggwa, one of my favorite Uganda Martyrs, and I would always ask him to intercede for me so that my faith grows stronger each day,” Mzee told the Ugandan bishops’ conference. “This year, I want to ask the Uganda Martyrs to intercede for my family for peace and provision as well as other unmarried families so that they can be able to respond to God’s calling. I also want God to heal my feet so the pain that I am feeling can stop. 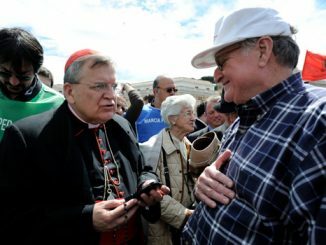 This healing will be a testimony to many old people so that they can start coming for this pilgrimage,” he said. A young pilgrim in Mzee’s group told the bishops’ conference that even though he was tired, he was excited to participate in the celebration. “…God gave me courage and strength to keep walking and I know that He will surely bless me. This is my first time to come for this Namugongo pilgrimage, and I came to pray for healing because I have a problem with my eyes and legs,” said 11 year-old Crescent Tindimwebwa, who made the trek with his grandmother. The shrine, built on the site where most of the martyrs were killed, is located about 10 miles northeast of downtown Kampala. An aerial shot of the celebration, provided by the Ugandan bishops’ conference, shows the vast crowds of pilgrims spilling out into the surrounding streets. “This is what it looks like when more than a million people gather together to worship God,” tweeted Catholic advocate Obianuju Ekeocha. The feast of the Uganda Martyrs honors 24 Catholic martyrs from the country, 22 of whom were killed between 1885 and 1887 under King Mwanga of Buganda (now a part of Uganda), and two others who were killed in 1918 in Northern Uganda. Twenty-three Anglican Ugandans were also killed for their Christian faith within the same time period. In the late 1800s in Africa, European powers were scrambling to colonize Africa. During this time of colonization, Christian missionaries also began to arrive and to evangelize the newly-acquired European territories. Among the Catholic missionary groups were the White Fathers (named for the color of their robes), now known as the Missionaries of Africa, who were successfully evangelizing within Buganda. Some of the Buganda Catholic converts included young pages in the court of King Mwanga, who grew increasingly intolerant of Christianity, likely for two reasons: he saw it as a threat to his power, and he resented the young Christian pages who rejected his sexual advances. The first Catholic martyr was Joseph Mukasa Balikuddembe, who was beheaded and burnt Nov. 15, 1885, for pleading with Mwanga to spare the life of James Hannington, and Anglican bishop who was to be killed for his missionary activities. Many of the other martyrs were killed in May of the following year. On May 25, they were ordered to go on a days-long death march to Namugongo for refusing to denounce their faith. Several were killed along the way by spear for refusing to continue walking, or for collapsing from exhaustion. One of the martyrs, Mathias Kalemba Mulumba, was killed in a particularly gruesome way. After two days of marching, he refused to walk further and asked for his execution. First his hands were cut off, then some of his flesh, and then his legs. However, his executioners stemmed the blood flow so that he would not die a quick death from blood loss. He died three days later from dehydration. The other martyrs who made it to Namugongo were kept alive for about a week, during which time they gathered what would be the instruments of their execution – firewood and reeds. On June 3, 1886, Charles Lwanga became the first of these to be martyred. He was ordered by the executioners to prepare his own death bed of firewood, and was then wrapped in reeds and burned to death. Twelve other Catholic martyrs were then also burned alive, along with thirteen Anglicans and several other prisoners. Three decades later, in northern Uganda, catechists Daudi Okello and Jildo Irwa were dragged from their hut by a group of attackers and speared to death, Oct. 18, 1918. Popular devotion to the martyrs remained strong in the country, and Charles Lwanga and his companions were beatified June 6, 1920. Bl. Paul VI canonized the group Oct. 18, 1964. The two catechists, Okello and Irwa, were beatified by St. John Paul II Oct. 20, 2002. Miracles attributed to the martyrs include the curing of the bubonic plague in two religious sisters, and the curing of a physical deformity in the feet and legs of a young boy. Francis, the shrine’s representative, said the witness of the martyrs should be a source of strength and courage for any Christians who experience persecution today. “When one chooses what’s right, he or she is remembered and treasured forever,” he told CNA. Stressed in the article is a very pivotal distinction–“religious plurality” is one thing, but glossy “diversity” or “cosmopolitanism” (especially in a muddled era like our post-modernity) would be quite another. “Multicultural equivalence of truly conflicting truth claims was rejected in the fourth century by St. Ambrose. Imperial powers tried to force Arian use of his Milan Cathedral and in this way to reduce Christianity to the status of one equivalent religion among many. (the above from Beaulieu, “Beyond Secularism and Jihad—A Triangular Inquiry into the Mosque, the Manger & Modernity,” University Press of America, 2012). 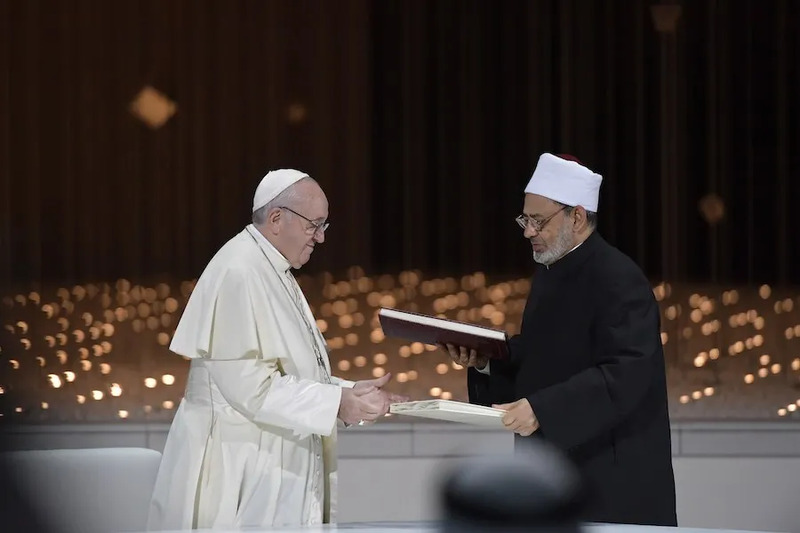 Great priviledge and a blessing to follow the visit of the Pope to Abu Dhabi. A real journey of Peace like St Francis of Asisi in the middle ages. may this journey yield rich fruits for religious liberty and peace for the world, particularly in Nigeria and Africa. Francis’ papacy has been a litany of confusing statements for the faithful on the most sensitive and delicate topics. The Church’s authority rests, in part, on its claim to communicate the teachings of Christ clearly and unambiguously. Francis has cast doubt on the former, has done a poor job of the latter, and by doing so has brought the Church’s legitimacy into question. 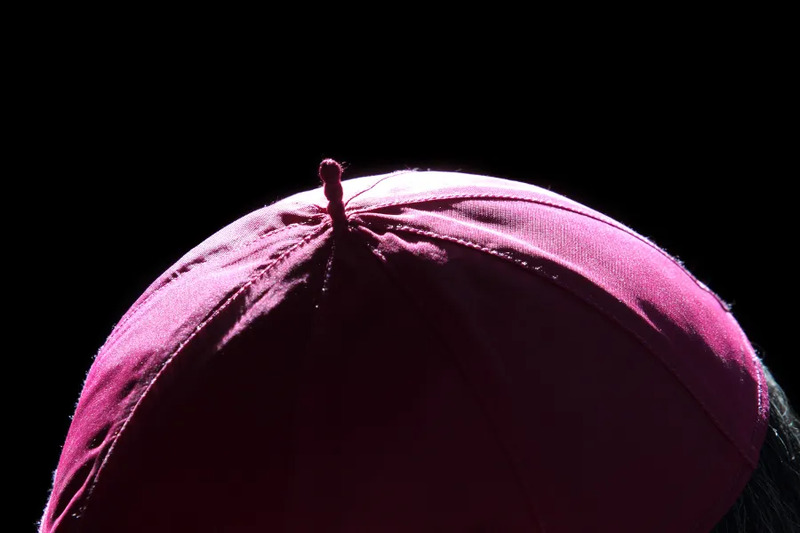 As such, he should display the humility to acknowledge that he is ill-suited for the job of Pope and resign out of love for the Church and mercy for the faithful.